Planning to organize a wedding shower for your close friend or sibling? Although a wedding shower may not be as important as the wedding event, this is something that you must carefully plan for a wedding shower is held to shower the couple with gifts that they can use in their new home as well as a sign of support from the bride’s family or a form of welcoming from the groom’s family. 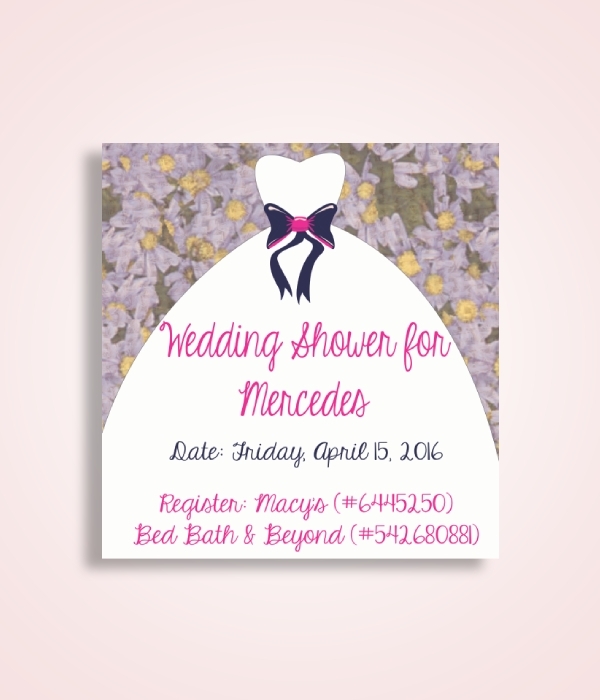 There are several arrangements that you need to take care of, and one of those is the wedding shower invitation. Typically, the invitation are to be sent to the parents of the couple, grandparents, uncle and aunts, cousins, and couple’s close acquaintances. In order to save you from the hassle of creating an invitation, here are awesome wedding shower invitation templates and examples that you can use or refer to. Apart from showering gifts to the couple, a wedding shower is also a way for the family members and close friends of the couple to spend time together before the big day. This is also a time to share good stories, recall childhood memories of the couple, eat and drink, and pay attention to the couple. 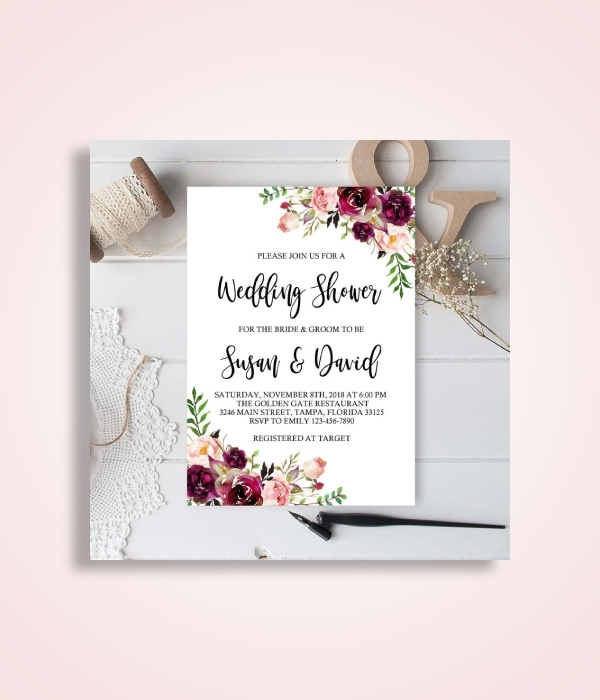 Hence, in order to gather close friends and relatives, the organizer must send them an elegant wedding shower invitation with the use of this excellently designed template. This high-quality template is created by professional graphic designers. Hence, you are guaranteed a presentable and elegant invitation. This is very easy to download and edit since it is available in a lot of file formats, such as Illustrator, Photoshop, MS Word, Publisher, and Apple Pages. If you are an artistic and creative individual, this artsy wedding shower invitation example would surely suit your preference. The plain white wedding gown with violet and pink ribbon perfectly complements the purple and yellow floral background. Written on the wedding gown are the important details of the wedding shower, such as the date, registration, and contact information. 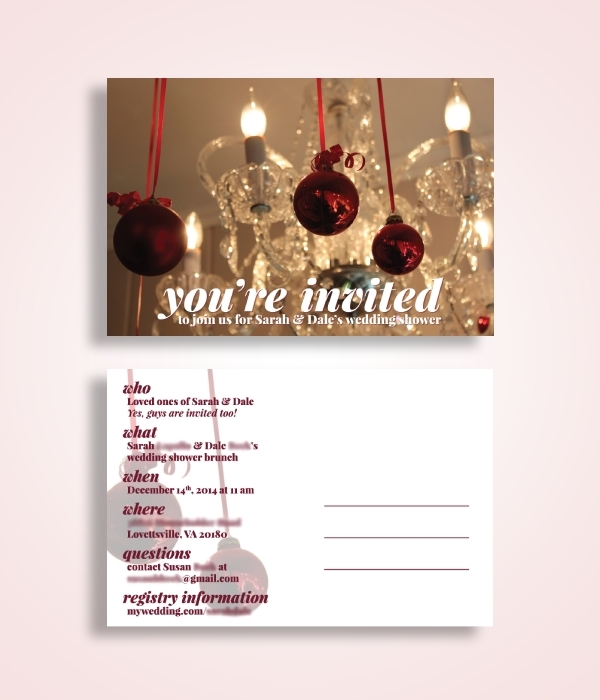 So, when you create an invitation, do not forget to include these details. For the design, you may choose your own preferred design or consider the preferences of the bride and groom. 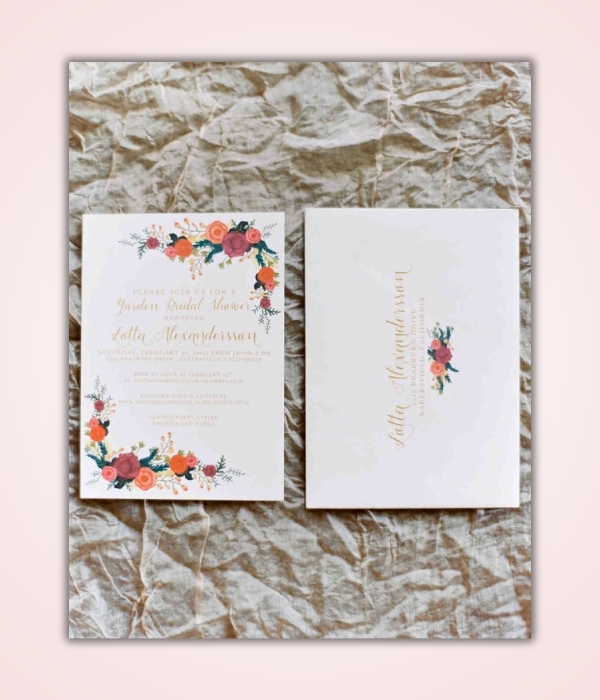 Floral designs are popular not just in wedding invitations but also in bridal or wedding shower invitations. Note that a bridal shower and wedding shower differs in many ways. For example, in a bridal shower, the celebration is typically held for the bride and the list of the guest includes the bride’s women friends and family; however, in a wedding shower, this is held for both the groom and the bride, and guests from both sexes are invited. Thus, when you create a wedding shower invitation, you must include in the recipients the family and friends of both the bride and the groom. Presented above is an example of a well-designed wedding shower invitation that you may use as your reference. If you want a modern-themed wedding shower, then this invitation is perfect for you. Because a wedding shower is a shower for both the bride and the groom, notice that the people invited are both their loved ones which include their family and close friends. Other important details regarding the wedding shower are also specifically included which are as follows: the date and time, venue, contact person with his or her contact information, and registry information. The contact information is important in case the recipients have further questions, comments, suggestions, and other concerns. If you prefer a rustic-designed wedding shower invitation, here is an example that you can refer to. 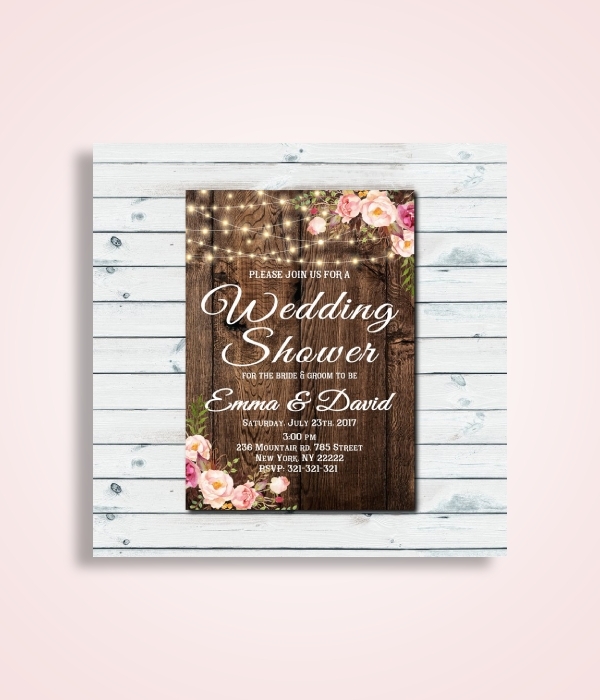 The classic background design makes the invitation more elegant and appealing to the recipient, making them more interested and encouraged to attend the wedding shower. The white cursive font takes the spotlight complemented with texts in serif fonts. The full details of the celebration are also included—the names of the bride and groom, date and time, complete address of the venue, and contact information of the host. In this sophisticated wedding shower invitation example, the designs on its border are patterns of different types of colorful flowers and vine leaves, making it a suitable design for a floral-themed wedding shower. 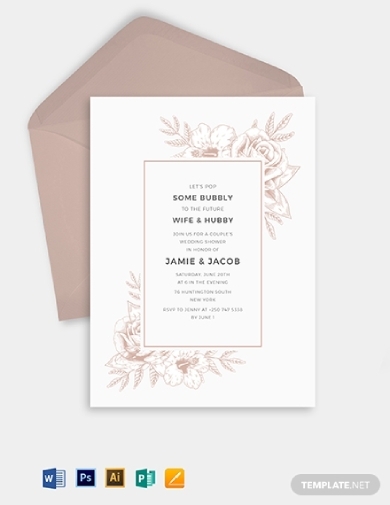 The full names of the bride and groom can be found on the face of the invitation as well as the necessary details, such as the date, time, and venue of the wedding shower celebration. If you are the one organizing the event, do not forget to include your contact details, for example, your phone number, email address, or social media account so that people, especially the invitees, can easily reach you in case they have any concerns related to the wedding shower party. Hopefully, the examples and templates above would help you when you start creating a wedding shower invitation for someone dear to you.